If you intend to watch the Giro d'Italia from the comfort of your own home, it's being broadcast around the globe across various networks - keep reading to see where. The action has been running from May 4 and concludes this weekend. Having started in Israel, the riders are now in Italy and finish in Rome after 18 stages in the host country. Well where did THAT come from? 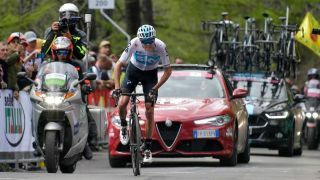 After being upstaged for most of the 101st edition of the Giro d'Italia cycling event by fellow Brit Simon Yates, Chris Froome has come storming into first place in the standings with only one competitive stage to go. It's a remarkable turnaround that sees Froome wearing the pink jersey tomorrow - and we'll tell you how you can get a free live stream to watch the Giro d'Italia finale. Love him or loathe him, it's Froome's and Team Sky's to lose. But last year's winner, Tom Dumoulin, riding for Team Sunweb isn't far behind. The rest of the field are over four minutes back, so you'd really fancy it to be one of these two now. Bear in mind however that stage 20 commences at the earlier start of 10.20am local time, so 9.20am BST, 4.20am ET, 6.20pm AEST. This year's Giro d'Italia is available in a record breaking 198 countries. Thanks to 18 different TV networks getting involved there are lots of ways to enjoy all the high-paced Italian cycling action. The Giro d'Italia 2018 route started in Jerusalem and ends in Rome across the 21 stages. This is the first time, ever, that a Grand Tour has gone outside of Europe. That makes for 3,562.9 kilometres of cycling with a daily average of a knee aching 169.7 kilometres. So how can you enjoy all the wheel spinning fun? Read on to find out as we tell you the best options to live stream the Giro d'Italia. And the best bit? It's possible to do so absolutely free. This year the Italian broadcaster Rai is actually going to share the Giro d'Italia event coverage in Italy for free. It's the only broadcaster we've found that's live streaming all the action without a subscription of some kind. And Rai also has an Android and Apple app for watching on your tablet or phone instead. Yup, that means you can stream all the wheel spinning goodness on whatever device you're using, all on RaiSport +. The catch? Well, all the commentary will be in Italian of course! But below we've listed the major broadcasters in English speaking countries. For UK residents the Giro d'Italia will get the Eurosport treatment. That means Eurosport 1, which is available in lots of broadcast and streaming forms, should make watching the racing simple. Eurosport is available with basic Sky TV packages or with a Eurosport Player monthly or annual pass - a free trial for which is available here - that also gives you access across loads of devices. Australia is getting the Giro d'Italia 2018 via Eurosport too. That means it can be watched via the Eurosport website or through the app or, of course, via a broadcaster that offers the channel. The Giro d'Italia 2018 is making its way to the US via Fubo.TV which means you can enjoy the cycling from multiple locations. Fubo is a sports focused streaming TV solution that lets you subscribe for what you want and stop when you're done – ideal for this event. Since this is app powered and delivered over the internet, you can watch it on lots of different devices. including smartphones, tablets, Smart TVs and streaming boxes. That means wherever you are you shouldn't miss the action. Canadians will be able to get in on the Giro d'Italia 2018 action much in the same way as their US neighbours can. That means Fubo.TV access in Canada where the events will be streamed to whatever device you're using. Simples. Which other countries can I stream the Giro d'Italia live using a VPN? A VPN will enable you to watch the Giro d'Italia 2018 from literally anywhere. So that obviously includes all the countries from which the players come from, so: Spain, Japan, South Korea, China, India, South Africa, Thailand, Germany, Italy, Sweden, Austria, Belgium, Argentina, Chile, Venezuela and Fiji.